In the spirit of Christmas, an annual stollen charity cake sale this Friday is aiming to sell a record amount of the German cake, with proceeds from the sale going to the Emirates Red Crescent charity. 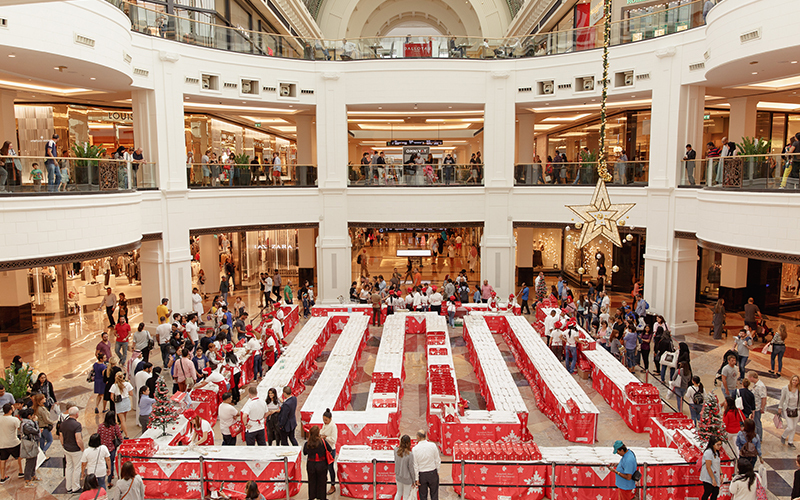 The thirteenth edition of the sale, set to be held on December 7th at the Mall of the Emirates, in partnership with Kempinski Hotel Mall of the Emirates, is being led by a team of 12 chefs and over 50 volunteers, who are set to make the sale a huge success once again. Sudqi Naddaf, Executive Chef at Kempinski Hotel Mall of the Emirates, and his team, have spent weeks preparing and baking around the clock to create the largest string of stollen made to-date. By the day of the sale, the team will have used more than 2,500 eggs, 625 kilograms of flour, 290 kilograms of raisins and 65 kilograms of marzipan to create this mouth-watering delicacy. Moreover, 133 kilograms of lemons and 142 kilograms of oranges will be zested to give the cake a burst of citrus flavour. The sixty-centimetre-long stollen loaves can be bought whole for AED100, AED50 for half a loaf or just AED5 for a delicious slice. Pre-sales will start from 5 December at Aspen by Kempinski, the hotel’s luxury lobby lounge. For more information, please visit the Mall of the Emirates website.